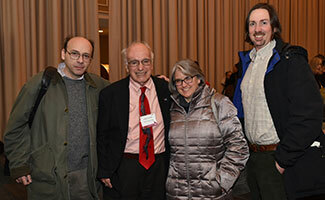 English Department faculty members congratulate Paul Lauter: (L-R) David Rosen, Lauter, Chloe Wheatley, and Christopher Hager (not pictured but also in attendance was Milla Riggio). Photo by Edward Savaria, Jr.
Hartford, Connecticut, January 22, 2018 – Paul Lauter, Trinity College’s Allan K. and Gwendolyn Miles Smith Professor of Literature, Emeritus, recently received the Francis Andrew March Award from the Modern Language Association (MLA) of America. The award, which honors distinguished service to the profession of English at the postsecondary level, was presented on January 6 during the MLA’s annual convention, held in New York City. Lauter is the 26th recipient of the March Award, which the MLA’s Association of Departments of English (ADE) established in 1984 “to hold up as an ideal the scholar and teacher who accepts responsibility for strengthening the life and work of departments, the field, and the English studies community considered as a whole.” The award is named after Francis Andrew March (1825–1911), who taught at Lafayette College and was the first professor of English in the United States. A Trinity College faculty member beginning in 1988, Lauter served terms as chair of the English department and director of American studies, and for many years served as director of the graduate program in American studies. He has served as president of the American Studies Association and is the founding general editor of the groundbreaking Heath Anthology of American Literature, now in its sixth edition, which redirected the field toward a more historicized, inclusive, and self-aware representation of the many voices and origins of American literature. A contingent of Trinity English Department faculty members, including Chloe Wheatley, associate professor of English and current chair of the department, attended the MLA convention and the presentation of the award to Lauter. 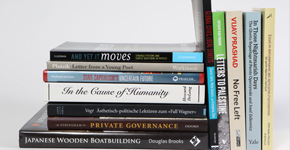 Lauter is the author or editor of several books, including From Walden Pond to Jurassic Park: Activism, Culture, and American Studies and, most recently, A History of American Working-Class Literature. During 1964 and 1965 he worked in freedom schools in Mississippi and in Roosevelt University’s Upward Bound program, and in 1967 he became director of the first community school project in the nation, at Adams-Morgan in Washington, DC. In 1972, he resumed his teaching career at the State University of New York, Old Westbury, an institution that especially served underrepresented groups such as black and Latino students and older women. He was one of the founding editors of the Feminist Press, an educational nonprofit organization founded to advance women’s rights and amplify feminist perspectives, and of the journal Radical Teacher. Read more about the ADE March award here. 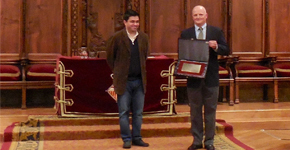 View the award citation presented to Lauter here.